We know there are hundreds of marketing conferences you could attend this year, mostly filled with recycled fluff. That’s why we’re here. 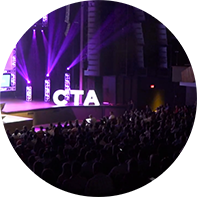 CTAConf is carefully curated to teach you next-level, actionable marketing tactics you can utilize the very next day. You won’t have to miss any talks – and you won’t want to. CTAConf covers every facet of digital marketing, including pay-per-click, conversion rate optimization, email, copywriting, landing page design and more. 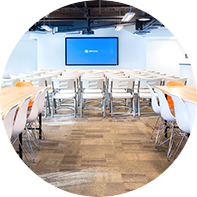 With over 3,000 square feet of versatile meeting space, the Unbounce Event Space is the perfect spot to host your next tech meetup or event. We have all the technology and service acumen needed to ensure your next event exceeds expectations. 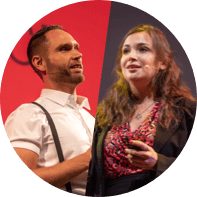 Where is Unbounce Speaking in 2019? Unbounce partners with local marketing and tech meetups. 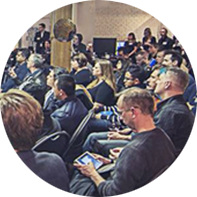 The events are casual and free, and bring together members of the Vancouver tech community to share tips & tricks, network, and learn from each other. Want to host your meetup at Unbounce? Get in touch with us at events@unbounce.com. From tech talks, hackathons and workshops to conferences and get-togethers, Unbounce loves to support our community and get involved. 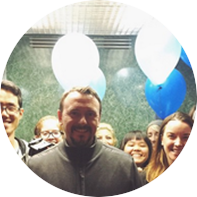 Want Unbounce to support your next cause or event? Reach out at pr@unbounce.com or come say hi at one the of the upcoming events we’re supporting in the community. We’re a pretty friendly crew at Unbounce and we like to meet new friends – whether it’s work peers, potential team members, or cool peeps from the community. 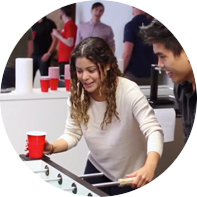 Once every quarter, we throw open the doors in Vancouver and Berlin so stop by our office for a coffee, some Mario Kart, and maybe even beat us at ping pong!